One of the outstanding cultivars, Crocus Pickwick has large goblet shaped flowers, clean white striped with lilac purple. Flowering in late winter to early spring this crocus is an excellent choice for growing in containers, especially when mass planted. 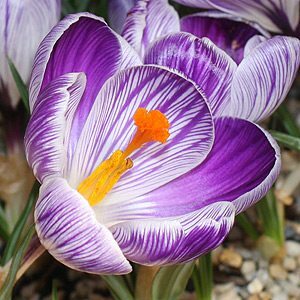 As this is early flowering Crocus Pickwick is best grown in full sun and it does require good light for the flower to open fully. In shade, or in overcast conditions the flowers tend not to open fully. Reaching around 12cm in height, the flowers are large and on sunny days they are impressive. In terms of most crocus flowers they really are giants and this is one of the real attractions. The bulbs are reasonably large and can be planted at around 10 cm (4 inches) deep. In the garden plant them around 8cm apart. In containers plant them closer for that wonderful mass display. Good sized mature bulbs will produce 3 – 4 flowers each. You can leave them in the ground in cooler areas and in fact they can be naturalized into the lawn if you wish. However the foliage does need to left to die down naturally. Like many crocus, a cool winter is essential for good flowering. In warmer climates bulbs may need to be lifted in summer once they go dormant and then given two months in the refrigerator (try the crisper). They need to planted out around mid winter in warmer climates after they have been chilled. In our garden, we grow them in the garden bed as well as in containers. The large flowers are stunning when planting them, select a position near a pathway where they can be seen. You can grow them in containers in a sunny courtyard if you wish. Plant bulbs in autumn to early winter at 10 cm deep. A humus rich well drained soil is best. Full sun is required for good flowering. Top dress with some aged cow manure and a little compost in autumn. Divide established clumps every 3 – 4 years as the bulbs multiply.